This is the second post in a series I’m writing about the second annual Celebrity Chefs of Canada event. Confused? Find out more details in my original post! A word to the wise – if you ever ask Chef Marc Lepine to describe one of his dishes to you, the answer will not be short. I should have known better, as I asked Chef Lepine to describe his favourite dish of the moment. It’s the scallop plate that he first prepared for February’s Canadian Culinary Championships in Kelowna (where, in case you haven’t heard, he blew the competition away). The five minute answer that followed made me gape in awe, and feel terribly guilty for having him recite all 20 ingredients on the spot. The dish involves ingredients ranging from celery compressed with sambuca to an aerated potato and truffle puree to tonka beans (one of his favourite ingredients at the moment that is actually banned in the United States). Even with his impressive naming of most of the ingredients, Chef Lepine had to email me a few hours later because he forgot to mention porcini mushroom powder. It is this attention to detail and use of creative techniques and flavours that make Chef Lepine unique. 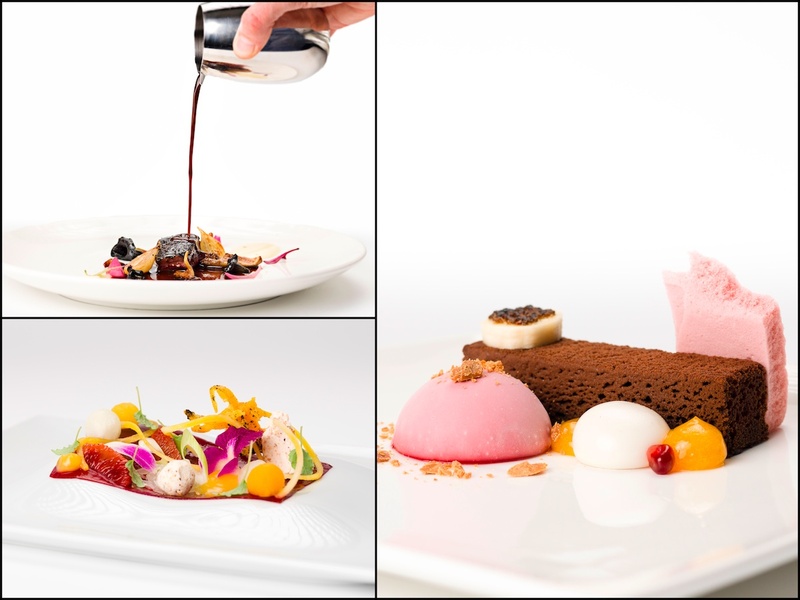 The creations that come from his kitchen are equal parts complex and obscure, creating a memorable mix of innovation (smoking chocolate cake with a pipe) and homespun “guilty pleasure food goes gourmet” (Dorrito gnocchi, anyone?). Despite recent culinary wins, Chef Lepine is still incredibly down to earth. He offers me a mug of green tea to match his own and we sit near the front window of his gastronomy kingdom, Atelier. When I ask to take pictures, he self-consciously points at a small brown stain on the front of his otherwise pristine chef jacket. 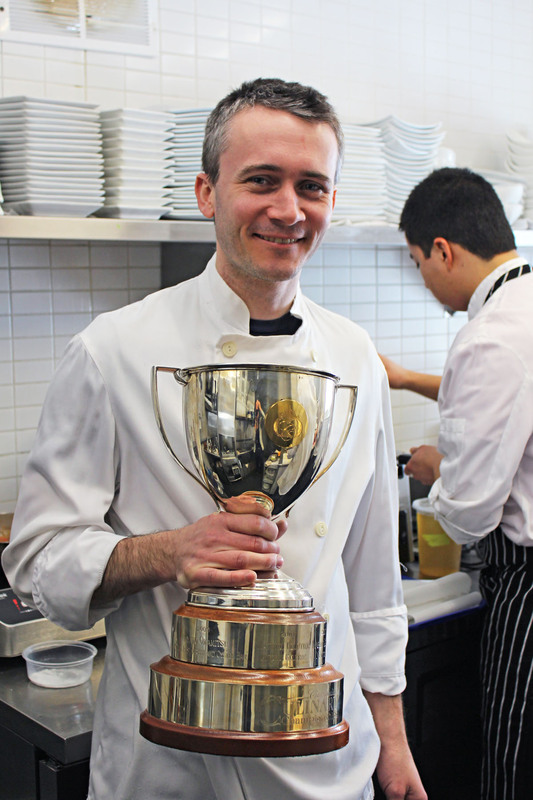 I tell him to hold his restaurant’s Holy Grail – the large Canadian Culinary Championships trophy – in front of it. It works. With Celebrity Chefs of Canada three weeks away, Chef Lepine is looking forward to participating for his second year. For him, the highlight of the annual event is simple: it’s all about the chef-to-chef interaction. This year he’s paired with Chef Quang Dang of West Restaurant in Vancouver. The two have been collaborating over email for the past few weeks, bouncing ideas back and forth before finally settling on a guidock clam dish. As for his pairing, Chef Lepine says he can sense Chef Dang’s passion for food through his emails. On the day of, Chef Dang will be responsible for the clam, while Chef Lepine will work on the rest of the plate. That plate involves jalapeno, beets, herbs, and a charred citrus pomello ash, all served with a side of Lepine-style creativity. Case in point: the latter is created by burning the leftover pomello rind to produce a special, charred coal. That coal is then ground into an ash, which Chef Lepine says is incredibly fragrant. “Chef Dang was really intrigued by that technique and apparently he’s doing something similar with apple cores and chives. He’s getting excited about the dish,” Chef Lepine says. Though I mention that he seems to be achieving a sense of national notoriety following his big Kelowna win, Chef Lepine remains modest and humbled by others’ talents.